Product #15693 | SKU CUFF-MIN-LH | 0.0 (no ratings yet) Thanks for your rating! The Sonnet CUFF-MIN-LH MacCuff Mini is a sturdy mounting solution that allows you to mount your Mac mini to the back of a monitor, under a desk, or under a table. The CUFF-MIN-LH MacCuff mini features a rugged steel frame with a refined, double powder coated finish to prevent scratches. With VESA mounting screw locations, you can easily instal MacCuff mini to VESA-compatible LCD displays to create a sleek and minimal workspace. Or to help eliminate desktop cable clutter, attach MacCuff mini under a desk or shelf using the provided drill template and screws. The open-frame structure of the MacCuff allows for full access to the ports, slots and power switch of your Mac mini and leaves WiFi and Bluetooth antennas uncovered to ensure uninterrupted wireless performance of your computer. 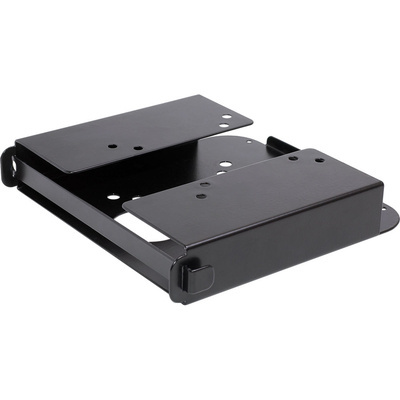 Installation is as easy as possible; all necessary mounting hardware is included as well as a HDMI to DVI-D cable for connecting to your monitor. Note! The included locking bar is intended for use as a theft deterrent and will provide added security only when used with a lock (sold separately).